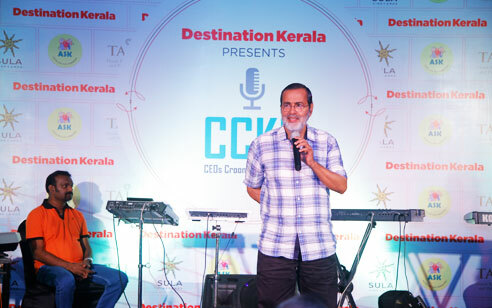 28 July 2016 Kochi: In a first-of- its-kind business event in Kerala, 18 high profile CxOs lined up to belt out chartbusters supported by a live orchestra for a ‘by invitation only’ audience of over 100 business friends and family including entrepreneurs, high net worth individuals, investors, senior decision makers and social influencers. 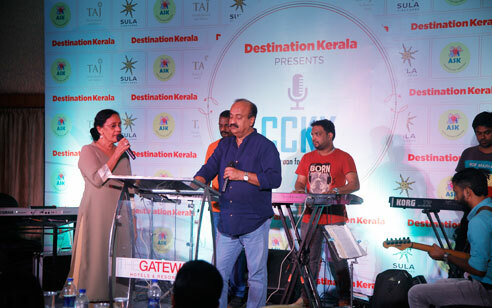 Destination Kerala Business Magazine organized this unique business networking event with a strong emphasis on social responsibility. 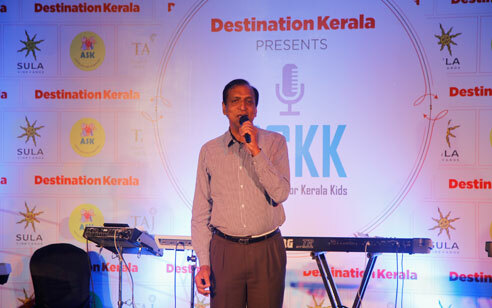 The event christened CCKK (CEOs Croon for Kerala Kids) was held in support of ASK (Aster Sick Kids) Foundation which helps kids in need of resources to undergo medical interventions. It was an evening reminiscent of college days and school reunions with good music, food and fun. It will also change the lives of under-privileged kids. 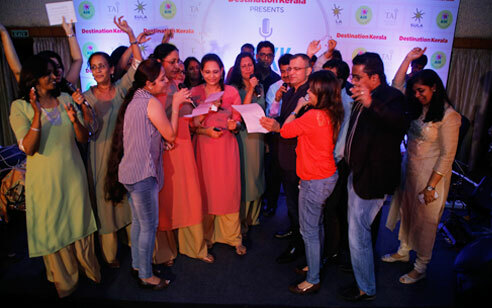 "The unique format of the event aims to go beyond cheque book charity and engage business leaders actively in an enjoyable social responsibility initiative that is sustainable too. We hope to take it across Kerala", said Jose Kunnappally, chief edi tor, Destination Kerala business magazine. Sheela Kochouseph Chittilappilly (CMD, V Star Creations), O T Alexander (MD, The Avenue Regent), Dr V A Joseph (Former Chairman, MD & CEO, South Indian Bank and currently Director-Relations, Rajagiri Hospital), S Unnikrishnan (Kerala Head-Sales & Marketing, Sobha Ltd.), Vipin Nadakkal (VP & Head of Marketing, Geojit BNP Paribas), Dr Harish Pillai (Cluster Head-Kerala, Aster DM Healthcare and CEO, Aster Medcity), S R Nair (CEO & Chief Mentor, MentorGuru), Jyoti Aswani (Managing Partner, Aswani Lachmandas Group), Nuthan Manohar (Founder & CEO, Me Met Me), Jibran Asif (Director, Abad Hotels and Resorts), Sherry Samuel Oommen (Partner, NASH Capital Partners), Roshni Binu, CEO, educ kshetra, Asha Pramod (Director, VETA, A T.I.M.E Group Company) and Ladies' CEO Forum (Chandra Vadhana R, Founder & CEO, 4tune Factory - T4Trainer.com, Dr. Devika Menon, Director, Princy World Travel, Helen George (CEO, Eka Boutique), Riya Ann Cherian, Director-Academics, Guiders Education and Nirmala Lilly, CEO, Infinity Hospitality Services) were on stage. The evening saw evergreen Malayalam and Hindi hits like Swargaputri Navarathri (Nizhalattam), Anuraga Ganam Pole (Udyogasta) and Ente Swapnathin Thaamarapoikayil (Achani) along with Chehra Hai Ya Chaand Khila (Sagar) and Chalte Chalte Mere Yeh Geet (Chalte Chalte) and recent hits like Pookkal Panineer Pookkal (Action Kero Biju). In English, My Heart Will Go On (Titanic) and You Placed Gold On My Finger (Don Williams) made the cut. ASK Foundation videos were played to sensitize guests on the need to support world class healthcare for all especially children from under privileged backgrounds where a timely intervention can help send the kids from hospital back to school. 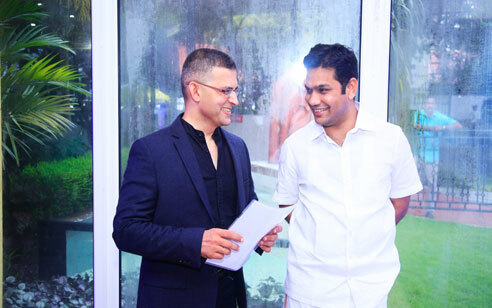 Dignitaries who attended the function included Hibi Eden MLA, Kochouseph Chittilappilly (Chairman, V Guard and Wonderla), Mithun Chittilappilly, (MD, V Guard), R Manomohanan, (CEO, Muthoot Capital Services), Deepak Aswani (Chairman, Aswani Lachmandas Group), Raju Hormis (Head, CSR, Federal Bank), Rajeev Menon (CEO, Rajasree Motors Mercedes Benz), Jagdish Bhojmwani (India Head, SilkAir), Vivek Krishna Govind (Partner, Varma and Varma), Sajeev Nair (Chairman, Bramma Consulting) among many others. The dignitaries felicitated the management of Destination Kerala for coming up with an innovative idea to marry business with social responsibility.